I don’t know when exactly or how it happened, but something sparked the idea that green juice might be fun to try and the next thing I knew, I was obsessed. I’ve been juicing and drinking a glass of green juice every morning since my first glass last week. 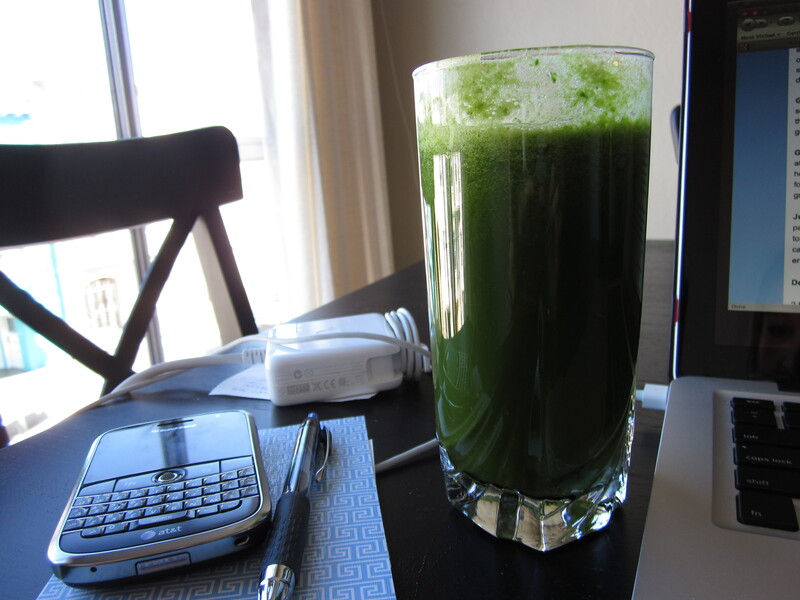 That glass was also the first time I ever had fresh green juice and I was so pleasantly surprised. I scoured health blogs and magazines for “the perfect” recipe (searching for “perfection” = story of my life!) and came up with something that appealed to my palate. I recommend using organic ingredients whenever you can and I’ll list the ones you most want to use organic below before the recipe. Also, the recipe is meant to give an idea of a green juice — experiment to find your favorite combination. To make weekday morning juicing easier, I usually wash and prepare the ingredients and divide them into separate ziplock bags. Each bag is labeled “Green Juice” 1, 2, 3, …etc. Try to avoid dicing the cucumber, carrots or apples too long before juicing as the veggies tend to dry out and the apple will oxidize. For me, it’s easier to have a morning green juice when I feel like it. It wakes me up and I feel energized, light and refreshed. Otherwise, I think it’s perfect as a post-workout tonic or as a snack. I don’t really recommend using it to replace a meal, though it certainly has enough veggies to count as a salad. My first juice was before dinner and I really didn’t know what to expect. I was amused by the super dark green color — it was interesting and kind of cool, and the taste was so fresh and phenomenal. Shortly after drinking it, I walked to a neighborhood restaurant for dinner, and on that short walk I started feeling the effects. I felt “brighter” and lighter and the bonus was that as I incorporated green juice into my days, I found myself making smarter nutritional choices. Even better: I don’t crave coffee or soda anymore :) Give it a try!